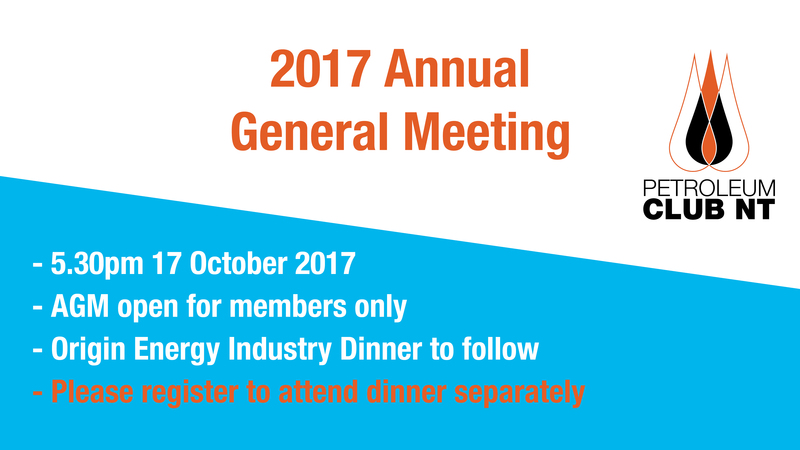 On behalf on the Petroleum Club NT Board of Directors, I would like to invite members to attend our 2017 Annual General Meeting (AGM). The business to be transacted at the AGM is as per the Constitution. An agenda will be made available for PCNT members to download from the members website. The AGM is a members only event that will immediately precede the October Industry Networking dinner open to our fellow industry colleagues and guests. Our guest speaker for the November Industry Networking dinner is David Close, Origin Energy Chief Geologist and Exploration Manager. MEMBERS PLEASE NOTE: AGM FORMALITIES WILL COMMENCE AT 5.30PM SHARP.